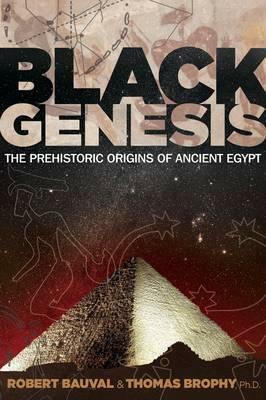 ANCIENT MYSTERIES / EGYPT "Black Genesis is a captivating, thought-provoking, utterly intriguing read that traces back the origins of the high civilization of ancient Egypt into deepest prehistory. Buckle your seatbelts for a rollercoaster ride . . ." --Graham Hancock, author of Fingerprints of the Gods Relegated to the realm of archaeological heresy, despite a wealth of hard scientific evidence, the theory that an advanced civilization of Black Africans settled in the Sahara long before Pharaonic Egypt existed has been dismissed and even condemned by conventional Egyptologists, archaeologists, and the Egyptian government. Uncovering compelling new evidence, Egyptologist Robert Bauval and astrophysicist Thomas Brophy present the anthropological, climatological, archaeological, geological, and genetic research supporting this hugely debated theory of the Black African origin of Egyptian civilization. Building upon extensive studies from the past four decades and their own archaeoastronomical and hieroglyphic research, the authors show how the early Black culture known as the cattle people not only domesticated cattle but also had a sophisticated grasp of astronomy; created plentiful rock art at Gilf Kebir and Jebel Uwainat; had trade routes to the Mediterranean coast, central Africa, and the Sinai; held spiritual and occult ceremonies; and constructed a stone Calendar Circle and megaliths at the ceremonial site of Nabta Playa reminiscent of Stonehenge, yet much older. Revealing these "star people" as the true founders of ancient Egyptian civilization, this book completely rewrites the history of world civilization, placing Black Africa back in its rightful place at the center of mankind's origins. Egyptian-born ROBERT BAUVAL began studying Egyptology in 1983. His first book, The Orion Mystery, was published in 1994, becoming a number-one bestseller translated into more than 25 languages. His research has been featured in documentaries throughout the world. He lives in Torremolinos, Spain. THOMAS BROPHY, Ph.D., is an astrophysicist who has worked with NASA, including as a member of the Voyager II spacecraft instrument teams. The author of several books, including The Origin Map, and numerous published articles in scientific journals, he lives in Encinitas, California. Complex in the World Be Destroyed? Egyptian-born Robert bauval began studying egyptology in 1983. His first book, The Orion Mystery, was published in 1994, becoming a number-one bestseller translated into more than 25 languages. His research has been featured in documentaries throughout the world. Thomas brophy, Ph.D., is an astrophysicist who has worked with NASA, including as a member of the Voyager II spacecraft instrument teams.